Anti-immigration executive orders marked the first week of the Trump administration, creating a shock-and-awe rollout of initiatives to build a 1,900-mile wall along the border with Mexico, to cut off federal funds to “sanctuary cities” and to ban refugees from seven Muslim-majority countries. 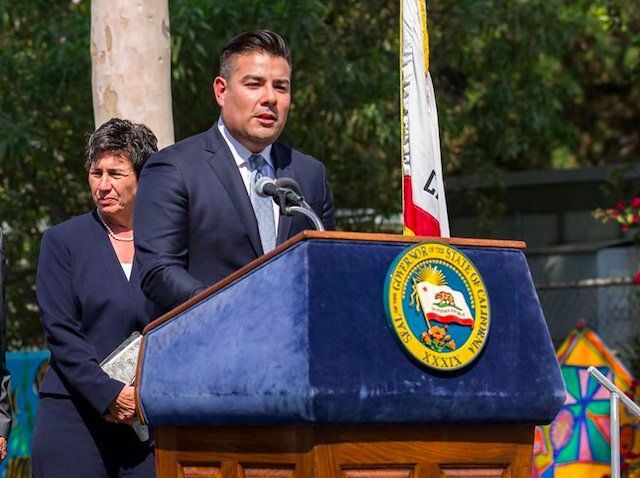 But as far as one part of Trump’s plan is concerned, the California stretch of Trump’s frontier wall won’t get anywhere if California state Senator Ricardo Lara has his way. Last December Lara introduced Senate Bill 30, which would require California voter approval of any wall construction along the California-Mexico border. California can be harmed “in many ways” by a border wall, he told Capital & Main in a phone interview. “We know that there’s been instances where, if there’s a direct harm from the federal government to a state, the state can assert its rights to defend itself,” said Lara, a City of Commerce native whose district includes small cities in southeastern Los Angeles County. Lara cites potential economic damage to Californians, as well as environmental harm to delicate eco-systems near the border. Much work has been done to clean up the Tijuana River and restore watersheds there, he said. A physical barrier on the California border would impede travel to Baja California, where many Californians have homes—opening up the potential for lawsuits by property owners. “There’s a lot to be considered,” he added. “Executive order” has the ring of a clean fait accompli —the President signs a decree; governmental machinery fires up to carry it out. End of story. Or not. Even executive orders have not-so-fine print that can bring in court rulings and the need for Congressional action that will bog them down. The building of a wall with our third-largest trading partner remains mired in the high-profile arguments about who will pick up the check for it—a bill that by most estimates will exceed the $10 billion claimed by the president. His administrations claims that U.S. taxpayers will front the cost and await reimbursement from Mexico through a 20 percent tax on imports from Mexico. But critics say it is a plan that will cost American consumers and also land the administration and Congress in a legal and political thicket. As for cutting off federal funds to sanctuary cities — which include San Francisco and, in a partial sense, Los Angeles – that threat will also run up against some hard political realities. “Carrying out immigration policy is the task of the federal government,” said Carol Sobel, who practices law in Santa Monica and was senior staff counsel at the American Civil Liberties Union Foundation of Southern California for two decades. Sobel pointed to a 2012 Supreme Court decision that struck down three of four provisions of Arizona’s SB 1070, a measure that had required law enforcement to stop residents and assess immigration status. The court’s decision affirmed that immigration policy is the responsibility of the federal government. One member of a U.S. Congressperson’s staff, who spoke on background, told us that it’s all new territory but Trump’s executive orders are now under a microscope – if analysis shows that there’s evidence that executive orders aren’t following federal law they could indeed require congressional action to go forward. Any funding agreements between the federal government and local jurisdictions would have to be amended by Congress to include language that that stipulates exactly what is required to receive funds—such as the demand that local law enforcement inquire about immigration status and turn the undocumented over to federal authorities. “The statute would have to be amended by Congress,” she said. Bobbi Murray has reported on politics, economics, police reform and health-care issues for Los Angeles magazine, L.A. Weekly and The Nation.